Triathlon’s combination of three different sports creates dynamic races. Comparing to single sport endurance events such as marathon running, you have to account for the strengths and weaknesses in each of the legs. While you can be pretty sure that the winner of a marathon will be close to the front after 30k, things are more complicated for a triathlon. The T2 leader is in a great position to win the race, but stronger runners keep the race interesting for much longer, and often big events are decided very close to the finish line – just think back to Kona 2014 when Mirinda Carfrae was able to win the race even after being more than 15 minutes behind in T2. There has been a lot of discussion about the “most important” leg in a triathlon. In addition to getting the balance right, it’s still interesting to ask if long-distance triathlon favors the stronger bike riders (that will still need to have a decent run) or if everything is decided on the run and the strong runners just have to make sure to not fall too far behind on run. This post discusses this issue from a statistical view point. I have analyzed Pro race results from 2005 to 2016, looking at more than 500 male and female races with a decent number of results from almost 300 Ironman and Challenge events over the IM-distance. 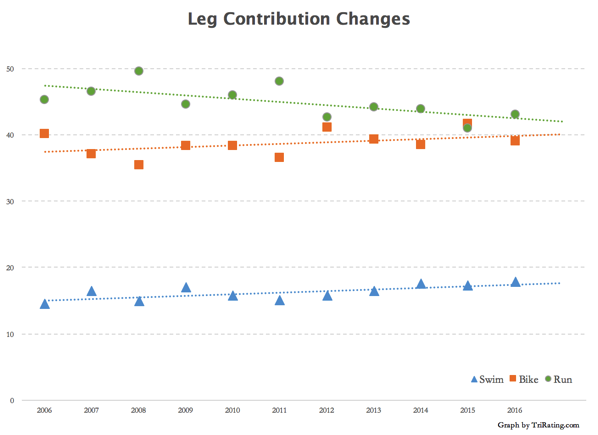 For each of these I have calculated the “relative importance” of each of the legs with a statistics package. The concept of relative importance describes where the race is decided – not necessarily where the most time is spent or where the largest differences occur, but which leg matters most for the final outcome. This race was basically decided after the swim. Liz Blatchford built a gap of more three and a half minutes to her competitors. She went on to post the best run and bike times as well, but the gaps were smaller than on the swim. Similarly, the order of athletes behind her didn’t change much after the swim, for example Gina Crawford was second in T1 and had the second best bike and run. It’s quite rare for the swim to be the deciding leg, there were only five races (out of more than 500 or less than 1%) where the swim was the most important leg. In 2014 the men’s Kona winner was Sebastian Kienle – he built a dominating lead on the bike that he was able to hold on to during the run. Behind him there were a few shuffles on the run, but other than a few athletes “exploding” on the run the time differences were quite small. Last year’s male Kona race was wide open until the run: A group of seven athletes were leading into T2 less than a minute apart. Six of these finished in the Top 7 in the end, with the time differences on the run pretty much determining the order athletes finished. Only Patrick Lange managed to climb into the Top 7 – on the back of a new Kona run course record. The Top 5 women had almost the same bike splits: Yvonne Van Vlerken was the fastest with a 4:54, slowest among the Top 5 was Mirinda Carfrae with a 4:58 which was still the seventh fastest bike time – the fast bike times allowed them to separate from the rest of the field or make up lost ground after a slower swim. The top finishers also had pretty similar run times just above three hours with four of the five fastest runs among them, solidifying their positions at the front – exceptions were the winner Mirinda Carfrae with a 2:50 and fifth place Caroline Steffen with a 3:11. The graph above shows that the relative importance of the swim has increased in previous years but is still at under 20%. Similarly, the importance of the bike has been increasing, it is approaching the importance of the run. The run is still still the most important leg but with a smaller margin now than ten years ago. In fact 2015 has been the first year where I observed the bike on average being more important than the leg. 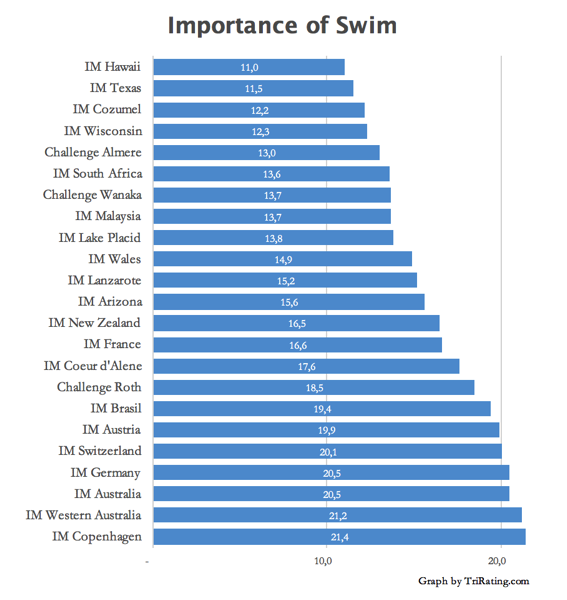 The increased importance of the swim shows that at the top level of our sport you have to be a good swimmer as well. This confirms the points that Tim Floyd and I made in our post “The Cost of the Kona Swim” for LavaMagazine. It gets more and more important to be able to follow a fast bike with a fast run. In the past, the faster bike riders have always struggled a bit on the run, in order for them to be successful they can no longer afford to lose too much time on the run. For the faster runners it’s the other way around: For them to be successful they can’t be too far behind in T2 – which means that they have to ride more aggressively, even if this ends up hurting their run times a bit. I think this interpretation is supported by the development of race times we’ve seen in the last few years: For a while male athletes struggled to balance the bike and run. In 2013 we’ve seen a number of 2:40 runs: Bart Aernouts (at IM France) and Victor Del Corral (at IM Florida) ran 2:37 marathons.In 2015 there were some crazy fast bike times, for example IM Texas saw two great bike splits with a 4:10 by Joe Skipper and a 4:11 by Lionel Sanders, but they only ran 3:04 and 3:11 and the race was won by Matt Hanson with a 2:45 run. In 2016 athletes were much better at getting the balance right: A world record by Jan Frodeno (7:35 at Roth with a 4:08 bike and 2:39 run) and the fastest time in an Ironman-branded race by Lionel Sanders (7:44 at Arizona with a 4:04 and 2:42). Another question that is often asked is which courses favor certain types of athletes. Kona is actually the course with the lowest average swim contribution. I think this is mainly caused by a relatively evenly matched field, and everyone tries to stay with the front group as long as possible, usually resulting in relatively large front groups coming out with very small differences. Compare that to IM Germany, IM Western Australia or IM Copenhagen, where often the swim leader manages to create a gap and then goes on to win the race. Think of Jan Frodeno in Germany 2015, Luke McKenzie at Western Australia 2015 or Camilla Pedersen at IM Copenhagen 2012. If the bar goes to the left and into the red, the bike leg has a higher contribution, if it goes to the right and into the green, then the run is more important. Also, the longer the bar the larger the difference is. 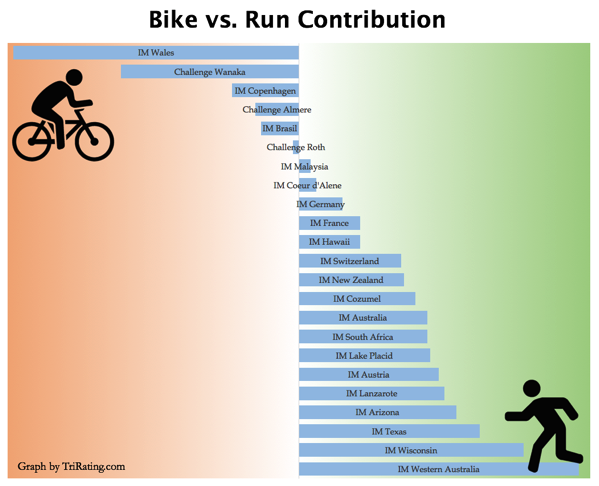 IM Wales is the best course for the strong bike riders (with the bike leg contributing 20% more to the final result than the run), while Western Australia clearly favors the runners (run contribution 19% larger than the bike). Each race has different participants creating different race dynamics, influencing where important things happen in the race, averages help to identify differences between courses. While the swim and bike are getting more and more important, the leg with the largest contribution to the final result is still the run. For most courses the contribution is between 13 and 18%, only very few have a swim importance slightly above 20%. With Ironman Wales and Challenge Wanka there are only two courses that clearly favor the bike leg (bike contribution more than 5% higher than the run contribution). Conversely, there are 12 courses favoring the run, the run legs at IM Wisconsin and IM Western Australia showing the largest difference. While the analysis presented in this post is based on Pro data, the conclusions about the courses seem to be properties of the courses rather than the fields racing the course. Therefore, they should apply to agegroupers as well and can be used as a general guideline to decide which course might favor the strengths of a particular athlete. But even with the differences between courses affecting the importance of the legs, triathlon is truly a sport of its own: You can only do well if you are great in each of the three legs. The interaction between the disciplines makes triathlon such an interesting sport to follow and to participate in. This is a very interesting and well researched and well presented article. Thank you for the great work you do. Its always an interesting read. That is super interesting, thanks so much! – Wales seems to be the “best race for bikers” as the course is super tough and you can therefore make a big difference. It makes sense. The other “tough” course is probably Lanzarote where the run seems to be very much “more important”. Can you say from the data why there does not seem to be a direct correlation between it? – What kind of algorithm did you use for the calculation? 2016 Phil Graves destroyed on the bike and Nick Baldwin was also very fast but Marc got them both in the end with a very strong run. In the women race, Darbi Roberts lost 17min on the bike to Jeanne Collange and caught her on the run. In 2015 Jesse Thomas did basically the same thing and “caught” Markus Thomschke in the end. In 2014 the race was also decided on the run as Matt Trautman just ran faster than Fraser Cartmell. From a “naive” standpoint it looks as if the run seems to be the “decider” in die end. Would be great to get some insights on this here as well. – Does the calculation take into account your “rating” of the athletes due to their relative strength in the different legs? E.g. Athletes choosing their races based on their own “feeling”. If Wales is for example primarily chosen by “strong bikers” would that have an effect on the calculation?